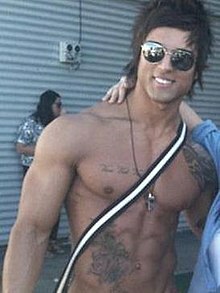 Aziz Sergeyevich Shavershian (Russian: Азиз Серге́евич Шавершян; 24 March 1989 – 5 August 2011), better known by his Internet handle Zyzz, was a Russian-born Australian bodybuilder, personal trainer and model. He established a cult following after posting multiple videos of himself on YouTube, starting in 2007. In July 2011, Shavershian gained more media attention when The Sydney Morning Herald published an article about the arrest of his older brother, Said, for illegal possession of anabolic steroids. On 5 August 2011, while on holiday in Thailand, he suffered a heart attack and died at the age of 22. Shavershian, an ethnic Kurd born in Moscow, was the youngest son of Maiane Iboian, who works in cardiology, and Sergei Shavershian. He had one older brother, Said Shavershian, who is also known by the screen name "Chestbrah". In the early 1990s, Shavershian and his family moved to Australia. He was raised in Eastwood, New South Wales, and attended Marist College Eastwood secondary school, where he achieved Dux of the college. Prior to his death in August 2011, he was set to graduate from the University of Western Sydney, with a degree in business and commerce. He was an atheist though he wore a rosary and his grave is adorned with a cross. Before becoming a bodybuilder, Shavershian had been described as a "skinny kid" and an ectomorph. Once he completed secondary school, inspired by his bodybuilder brother, he joined a local gym and began learning about nutrition and training, applying it to his pursuit of becoming a bodybuilder. He would spend three to four hours a day training in the gym. His favourite professional bodybuilders included Arnold Schwarzenegger and Frank Zane. Prior to his death, Shavershian was the poster boy of a subculture of amateur bodybuilding in Australia, dubbed "aesthetics", which he had made popular. He had established his own protein label, Protein of the Gods, released in June 2011. He also had a clothing line, and Zyzz's Bodybuilding Bible was released on 17 May 2011, based on a compilation of bodybuilding knowledge he had acquired over his four years of training. He asserted that the internet helped build up his brand, and it was ultimately made possible through the use of social media. On 14 July 2011, Shavershian's brother Said was arrested for possession of anabolic steroids, to which he pleaded guilty after Aziz's death. The Sydney Morning Herald covered the case, and included a photo of Shavershian. He objected to the use of his picture to illustrate what was essentially an article on the misuse of anabolic steroids. When asked by The Daily Telegraph, Shavershian denied ever using steroids, and claimed that his body shape was due to hard work in the gym and a strict diet. According to The Sydney Morning Herald, the company which employed Shavershian as a stripper maintained that he was "a lovely guy, aside from the steroids". Shavershian often used phrases such as "riding bicycles", which, according to The Daily Telegraph, is "gym slang for using a cycle of steroids". On 5 August 2011, Shavershian suffered a heart attack in a sauna, while on holiday in Pattaya. He was taken to a hospital, where doctors were unable to revive him. His family and friends placed news of his death on Facebook. His death was confirmed on 9 August 2011 by the Department of Foreign Affairs and Trade (DFAT). An autopsy revealed a previously undiagnosed congenital heart defect. His family stated he had shown several minor symptoms in the few months leading up to August 2011, including high blood pressure and occasional shortness of breath. He had a family history of heart problems. According to The Sydney Morning Herald, Shavershian's death was the sixth most searched death-related topic in Australia during 2011. Prior to his death, Shavershian had posted a video of himself on a social networking site, which would later come out 18th on Nine News' "Top News Videos of the Year" for 2011. Over the May 2011 to May 2012 period, Google statistics showed that he was searched as many times as Julia Gillard, the Prime Minister of Australia at that time. At the 2012 New Year's Day Field Day festival in Sydney, people dressed up as Shavershian in a tribute to him. Said Shavershian created a 19-minute tribute video for his brother, entitled Zyzz - The Legacy, and released it on YouTube on 22 March 2012. The video had been "trending the charts" on YouTube from late March to early April 2012. As of December 2018, the video has over 11 million views. Shavershian's followers still frequently post tribute videos dedicated to him, with a lot of them collecting over a million views. Shavershian's Facebook page had 415,767 likes. In April 2012, The Daily Telegraph took note that his fan page had over 399,671 fans before becoming inactive a few months later. According to an opinion piece presented in the Wentworth Courier, whilst hundreds of Wentworth Courier news articles published online have "disappeared into the void" since 2011, the "Zyzz story" still manages "to be read and frequently appears in the daily list of most clicked-on articles on the Wentworth Courier website". In a report on organized crime's control of the underground steroid trade, reporter Mark Willacy called Shavershian the "pin-up boy for the body building crowd." 2010 Underbelly: The Golden Mile Extra Episode: "The Kingdom Come"
^ Shavershian, Aziz. "How tall are you in cm?". Formspring.me. Archived from the original on 13 January 2014. Retrieved 12 March 2012. ^ "Spring.me". Spring.me. Archived from the original on 13 January 2014. Retrieved 25 April 2015. ^ a b Andrew Denny (11 August 2011). "Body Image" (Official YouTube video). Ten News. Network TEN (Australia). Retrieved 19 December 2011. ^ a b c d e f "Heart condition 'behind bodybuilder's death'". Ninemsn. 11 August 2011. Archived from the original on 12 September 2011. Retrieved 14 August 2011. ^ a b de Brito, Sam (11 August 2011). "Zyzz ripped from this life too young". The Sydney Morning Herald. Retrieved 14 August 2011. ^ Morrah, Michael (26 November 2014). "Young Kiwis experiment with potent steroids". 3 News. Archived from the original on 22 February 2015. Retrieved 27 November 2014. ^ a b c d e Danks, Katherine (10 August 2011). "Facebook favourite and aspiring model, Aziz 'Zyzz' Shavershian, 22, dies in Thailand sauna". The Daily Telegraph. Retrieved 14 August 2011. ^ a b c Phillips, Liam (16 December 2011). "Death and disaster unleashed a flood of news in 2011". The Sydney Morning Herald. Retrieved 17 December 2011. ^ Berry, Sarah (12 January 2012). "Incredible bulk: a journey from fit to fanatical". The Sydney Morning Herald. Retrieved 12 January 2012. ^ a b c d Whyte, Sarah (31 July 2011). "All pumped up, but tell us how?". The Sydney Morning Herald. Retrieved 5 November 2011. ^ a b "Heart attack killed 'Zyzz'". The Age. 11 August 2011. Archived from the original on 19 March 2012. Retrieved 7 March 2012. ^ a b Kennedy, Les (10 August 2011). "Sydney bodybuilder dies in Thailand sauna". Ninemsn. Retrieved 15 August 2011. ^ a b Budd, Henry (15 August 2011). "Customs reveals steroid abuse is skyrocketing". The Daily Telegraph. Retrieved 15 August 2011. ^ Shavershian, Aziz. "How old were you when your family moved to australia?". Formspring.me. Archived from the original on 19 February 2013. Retrieved 4 November 2011. ^ a b "Aesthetic bodybuilder Aziz 'Zyzz' Sergeyevich Shavershian's last posts". The Daily Telegraph. 11 August 2011. Retrieved 20 August 2011. ^ a b Vollmer, Tim (11 August 2011). "Bodybuilder Aziz 'Zyzz' Shavershian killed by heart defect". The Daily Telegraph. Retrieved 19 August 2011. ^ Shavershian, Aziz. "What religion are you?". Formspring.me. Archived from the original on 30 July 2012. Retrieved 18 December 2011. ^ a b c d Georgina Robinson and Sarah Whyte (11 August 2011). "Shattered: body of bodybuilder 'Zyzz' heading home". The Sydney Morning Herald. Retrieved 15 August 2011. ^ a b c d "Aesthetically Pleasing: Zyzz Shreddedshian Talks With Simplyshredded.com". Simplyshredded. 2011. Retrieved 16 August 2011. ^ a b Marcus, Caroline (3 December 2012). "Boys hit by body blues". The Daily Telegraph. Retrieved 3 December 2012. ^ a b Olding, Rachel (28 July 2012). "Sydney's newest sport - beat someone senseless or kill them for the heck of it". The Sydney Morning Herald. Retrieved 28 July 2012. ^ a b "Fans flock to Aziz Sergeyevich Shavershian's social network sites a year after his death". The Daily Telegraph. 25 April 2012. Retrieved 25 April 2012. ^ a b "Boys and the buff culture". Background Briefing. Australia. 2 October 2011. ABC. ABC NewsRadio. Retrieved 19 December 2011. ^ a b c Whyte, Sarah (27 May 2012). "Zyzz, the late bodybuilder who gets Googled as much as Gillard". The Age. Retrieved 27 May 2012. ^ Whyte, Sarah (7 August 2011). "Chestbrah fined". The Sydney Morning Herald. Retrieved 15 August 2011. ^ Baker, Jordan (2 September 2011). "Generation V buff, but not so pretty after dark". The Sydney Morning Herald. Retrieved 12 January 2012. ^ "Playing fast and loose with the juice". Bangkok Post. 26 January 2014. Retrieved 29 January 2014. ^ Olding, Rachel (7 December 2011). "Searches show our true cares". The Sydney Morning Herald. Retrieved 10 December 2011. ^ Grubb, Ben (7 December 2011). "Aussies more interested in iPhone than world's disasters: Google". The Sydney Morning Herald. Retrieved 10 December 2011. ^ "Top news videos of the year - 18 "Bodybuilder's bizarre video"". Ninemsn. 7 December 2011. Archived from the original on 14 January 2012. Retrieved 19 December 2011. ^ Ian Walker and Claire Harvey (2 January 2012). "Sydney throws a party as New Year 2012 arrives". The Daily Telegraph. Retrieved 26 April 2012. ^ Dunning, Craig (29 March 2012). "What's hot online Thursday, 29 March 2012". The Daily Telegraph. Retrieved 8 April 2012. ^ Dunning, Craig (3 April 2012). "What's hot online Tuesday, 03 April 2012". The Daily Telegraph. Retrieved 8 April 2012. ^ Mills, David (28 January 2013). "Shirtless dudes tip of the iceberg at Bondi". Wentworth Courier. Retrieved 28 January 2013. ^ Leigh Sales (9 March 2015). "Illegal steroid demand being met by outlaw motorcycle gangs". Australian Broadcasting Corporation. Retrieved 4 June 2015. The pin-up boy for the body building crowd was Aziz Shavershian. 'Zyzz', as he was known to his legion of fans, was a suspected steroids user, while his brother had earlier pleaded guilty to possessing anabolic steroids. ^ "National Road Trip Series Preview". filmotion.com.au. Retrieved 7 March 2012.